Ambitious sales leaders want to invest in technology that can help both them and their team reach their sales goals. Ideally, sales leaders will implement a system that allows for ease of use, seamless integration, great ROI, and ultimately improved performance for their reps. The key is determining which tool is the best fit for your company. In this post, we’ll discuss 5 ways that HubSpot’s Sidekick can save salespeople significant time and effort, making their jobs a whole lot easier, and allowing them to focus on what’s really important — creating and closing deals. Sales reps are looking to work smarter rather than harder, and Sidekick facilitates this goal. Not only does the tool assist with researching and prospecting, but it also offers invaluable data that helps reps qualify contacts with ease. Sales reps can quickly and easily qualify contacts by tapping into Sidekick’s list of suggested contacts, based on company sites related to your existing customers’. The ‘Insights’ feature will display all the relevant business data on the right-hand side of your screen so you have all the information you need in an organized list. This helps shorten the research process, saves hours spent online digging for qualified contacts, and arms you with all of the vital client information you need to close deals. In sales, time is clearly of the essence, and data entry simply takes time. In fact, studies show that sales rep spend only a third of their time actually selling. This can cause reps to lose momentum and can even lead to data entry errors. 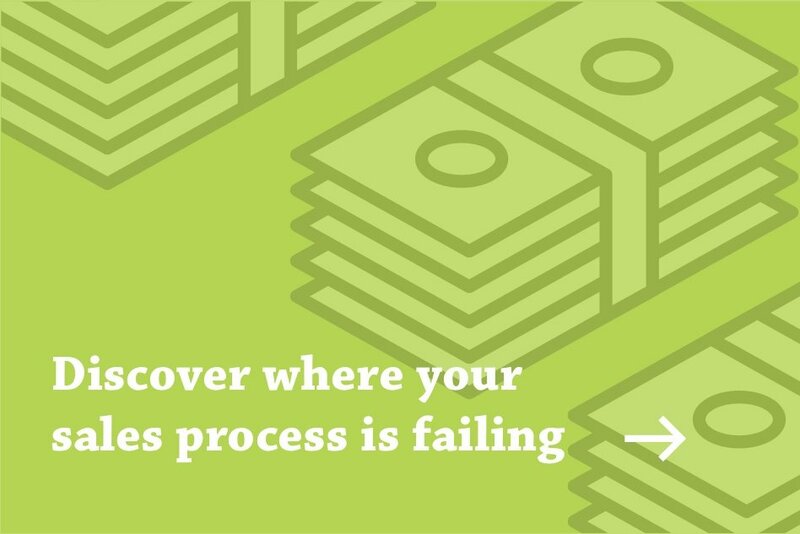 With Sidekick, you can focus less on data entry and more on selling. When Sidekick is integrated into your CRM (HubSpot CRM or Salesforce), you’ll never have to enter new contacts or log emails into the system because the sales tool does this automatically. Not only does this save valuable time, but it generates a seamless flow of data into the CRM, error-free. Marketing works hard to produce quality content for sales teams to use — but oftentimes, that content goes by the wayside. Sidekick allows sales reps to leverage that awesome marketing content via the creation of templates that can be easily accessed from their inboxes. This makes the valued content much more convenient to share; hence, it’s more likely to be used by sales to captivate prospects and drive more sales. If you’re using Gmail, Apple Mail, or Outlook, you can integrate Sidekick with your email platform to enhance your online communications. You’ll get real-time pop-up notifications when your recipients open your emails or click on your links. Essentially, you’ll always know what’s going on with your prospects. This kind of information can help you understand what’s working and stay up-to-date on your prospects’ activity. For example, if prospects are more likely to open emails on certain days and during certain hours, you can increase your sales effectiveness by sending when they’re most likely to open your email. If you can see that a prospect is not opening your emails, you’ll know that they’re not interested and you shouldn’t waste your time working to close a deal with them. Conversely, Sidekick can offer insights on ideal closing times for those opportunities that are hot in your pipeline. In addition, if you are planning ahead for when you’ll be out of the office, you can utilize Sidekick’s email-delay feature to write your emails ahead of time, and send them out at an optimal time. Sidekick’s value isn’t limited to emailing. 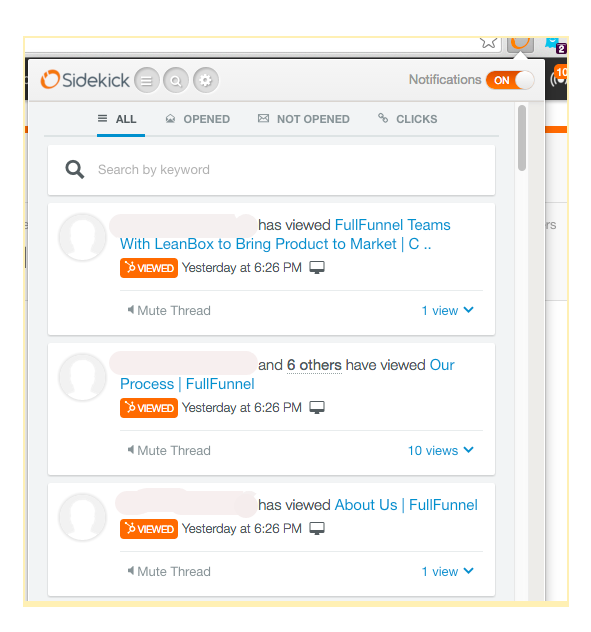 In fact, Sidekick offers many other in-inbox features that make a sales rep's job easier. With Sidekick you can click-to-call right from your inbox, saving valuable time that used to be spent navigating from email, to the CRM, then to your phone, and then back to the CRM to log your call. When you’re a busy sales person, it can be difficult to keep track of every channel by which your prospects are interacting with you. However, this is key information for qualifying prospects. Sidekick can track this information for you, in real time — across Facebook, LinkedIn, Twitter, email, or site forms — so that your qualifying data is always on point. 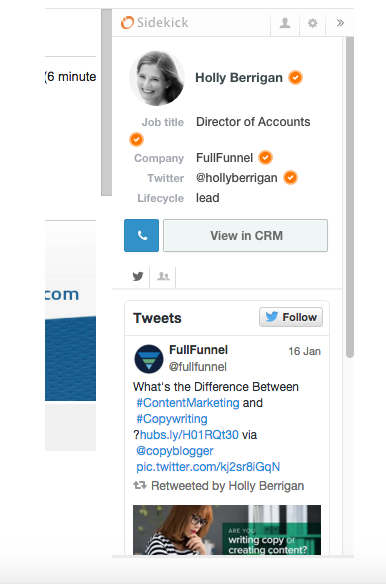 When you can see which channels your prospects are active in, you can then more effectively engage with them through those channels specifically, and appropriately follow up to keep those prospects moving down through the funnel. Combining valuable prospect information with real-time lead notifications and time-saving features, this application can not only make sales reps’ jobs and lives easier, but add tremendous value to your organization. When sales teams are able to focus on selling, goals will be met and exceeded. Interested in seeing what Sidekick can do for you? If you'd like to learn how you can leverage HubSpot Sidekick with your sales team, request a consultation!